The Qal’at al Bahrain, known to the world as the Bahrain Fort, is a significant landmark not only in the history of Bahrain itself, but of the Middle East as well. It holds an immense historical and cultural value, as it bears the marks and footprints of several civilizations, including the ancient people of Dilmun. The land is situated in the northern village of Al Qalah, about 5.5 miles west of the Bahrain Capital, Al-Manamah. 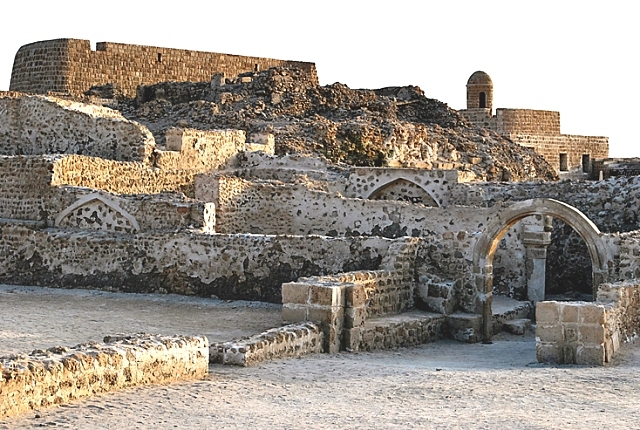 Evidenced by archaeological inspection, the fort is believed to have been the first site of the Dilmun capital. Until its discovery, not much was recorded about this civilization, but this site contains some of the richest remnants of its people. According to researched and collected data, early nations have been populating the area as early as 2300 BCE up to the 16th century. From the excavations done of nearly 25% of the location, it has been discovered that the fort served a multitude of purposes varying from residential, commercial, religious, public and of course, military. The fort is also a geographical wonder being a non-natural hill formed by 16 successive human occupations in the northern Bahrain near the coast. It is quite distinctive, being the most complete testament to the strategic geographic intelligence of the Dilmun people. The fort’s structure is of immense military tactical advantage as it gave the population great control over trade and commercial activities in the Gulf region. It is a square enclosure built from high-quality stone, bordering the coast, with a deep sea channel, sea towers, a trench, and agricultural palm-groves and gardens surrounding it. The mound or archaeological tell, is comprised of seven stratified layers now measuring to about 12 meters in height. The fort also led a very active participation in the commerce and politics of the region. Different cultures met in this trading port for economic exchange, resulting in a rich collection of multi-cultural artifacts like weaponry, fabric, pottery and coins. Through the years, it has also served as a Portuguese stronghold, a suburban building, as well as a religious center. Some of its subsequent settlers also include Persians and Kassites. Today, the fort is regarded as the biggest stronghold structure in Bahrain, and has been added as a UNESCO World Heritage site in the year 2005. The layout of the fort, revealed by excavations, describes much of its cultural background. A small residential settlement on its northern side, most probably housed villagers, led an agricultural lifestyle of planting trees, tending cattle and fishing. The walls surrounding the fort enclosed house-like buildings and a palace-like structure, which was most probably used as warehouses. The layout was also bounded by spacious roads. Some of the areas that have been uncovered include the Al-Hajjar necropolis, Madimat Hermand necropolis, Al-Maqsha Necropolis, Madimat Isa necropolis, Saar necropolis, Shakhura necropolis, Kassite Palace, and the Palace of Uperi. The unique architecture of the Bahrain Fort is of enormous historical and cultural value, which gave rise to its being a World Heritage site. Bahrain has been well taking care of this site, not only for historical documentation, but also to help preserve the untold history of a civilization that once existed in Bahrain.